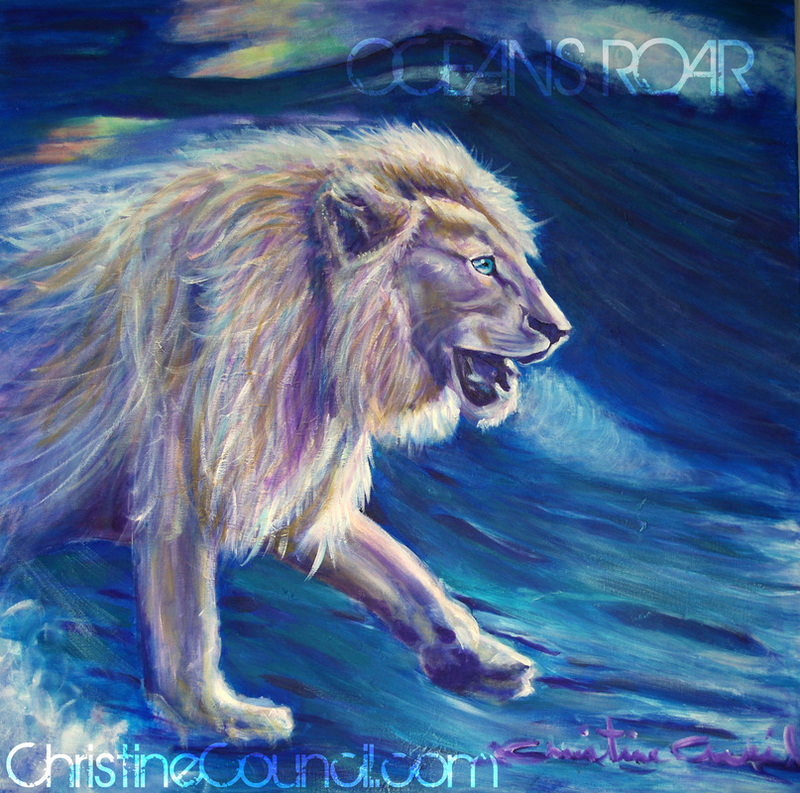 Oceans Roar Giclee on Stretched Canvas. Kissed By Love printed on 11" x 17" paper. God put this image together in January, but I was waiting for a church to paint it in, since I knew it would be a big canvas, and felt it was a corporate word. 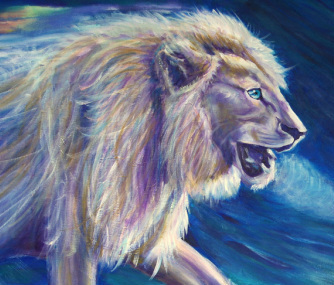 I had been wanting to paint a white lion for a long time. I love their blue eyes, reminds me of the day I saw the earth reflected in His eye, and painted Longing. 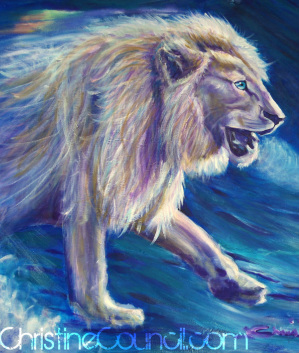 One day as I was seeking the Lord about it, I had the thought to paint the white Lion coming as a huge wave, then, that same day, someone tagged me in a photo on Facebook with a rainbow over a wave. I knew God was confirming I was to paint this. This is what I believe it means. The Lord is coming back, and He will come like a tidal wave. No one will be able to contain HIM. He is the promise, so I painted a rainbow above Him like the one that was in the photo I was tagged in, because even though He will come like a tidal wave, He has promised to never destroy the earth with water again. The water is for washing, it represents the Word of God. Jesus was the Word, and IS the Word...and His Word will always stand. He is walking on water because He has authority over all nations. He is coming out of the waters because, the He emerged from among humanity to deliver the words and works of God. He is roaring a mist because I believe that represents the Holy Spirit, or Ruach being released over the earth. It says in the Word that in the end times He will pour out His spirit...on all flesh...and I believe it will come as a wave. This week, I really started wanting to paint it again, and I remembered I had an old canvas sitting around that I had painted in a worship meeting. It was a painting of a cup being filled with water to overflowing. The place where I painted it, the worship leader kept saying that we should be so filled with God that we spill Him over, that we overflow with HIM. I knew I had painted the right image for the meeting, but, I just did not like it...and I wanted to redeem it. So...I had the thought to use it for the Lion. Since I was painting Him on water, it seemed to fit, especially since the new painting was to represent Him being poured out!